First, a little background on my system: I have a 8 year old female Maroon Clownfish in an established 55 gallon SPS/LPS reef with a 30 gallon sump/refugium. With the exception of the Tang, all have been living together for months and getting along fine. I introduced the Tang about two weeks ago. 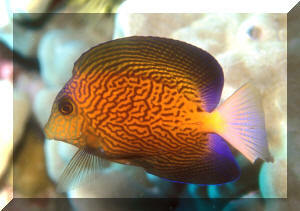 At the time I placed the Tang in the tank, I had a Jewel Damsel that harassed the Tang relentlessly. That same day, I removed the Damsel and, in the process, rearranged the rockwork. Thereafter, the Tang found a nice niche between two rocks where he could hide. It's big enough for him to turn around in, but not really big enough for the large female Maroon to squeeze into. Since the Tang was added to the tank and the Damsel removed, there has been no aggression between the remaining occupants. Last night, the female Maroon managed to follow the Tang into his rock cave. I saw her in there with the Tang, and they seemed to be getting along fine. I'm fairly certain she could not figure out how to get out of the tight spot she was in, as she did not come out to sleep with the male Maroon in their anemone where she normally does. When I looked in on them this morning, the female Maroon was ragged looking, and scraped up, with scales missing on her side, rough patches of skin, and ragged fins. I'm guessing she probably wound up scraping against the rocks last night trying to get out, although I suppose it's possible the Tang may have acted aggressively over her occupying his space. In any case, is there anything I can do to help her heal? She refused to eat this morning, but was still swimming around. She was hanging out on the opposite side of the tank from her anemone, which is also slightly unusual. Obviously, maintaining water quality is important, but is there anything else I can do? I just ran home from work to check on her. I wanted to make sure she wasn't being harassed or further injured by anything. The Kole Tang has left her alone as far as I can tell. She has settled near her anemone and her mate again. The Tang seems to understand her territory, and avoids the area. Based on her injuries, it seems as though she was scraping against the rocks quite a bit, as there are significant abrasions on her right side. Her left side is less affected. I test using Elos test kits, although my phosphate kit is API. I doubt the 0 level of phosphate simply because I do have some amount of algae growth off and on, but that was the reading I got from the kit. I know that the Tangs can be aggressive at times, but this Kole Tang appears fairly mild-mannered. Even when the Damsel was attacking him (at less than half his size), he never did fight back, just tried to get away. 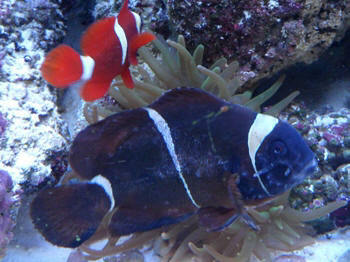 I have not yet seen either the Tang or Maroon chasing each other or anyone else in the tank. I doubt I could get at the Kole to remove him as he stays hidden much of the time. There is substantial rockwork in my tank. I'm fairly certain moving rock around to get him out would just cause more stress to everyone. Since he's not actively pursuing the Maroon, I'm not certain he's a serious threat at the moment, but I will definitely keep an eye on him. I'm planning a water change once I get home from work. I'm sad to see one of my critters injured and just wanted to be sure I was doing all I can. I do appreciate your help. I've attached a photo of my Maroon's worst injuries. There are some algae marks and scratches on the tank glass, but I think you can get the general idea. My Tomini Tang is aggressively chasing and fighting with the tribal blenny but not the other tankmates! What can be done? (there is 2"+ around the sides and back of the live rock) and has picked fights with him. There's plenty of macro and microalgae sources including my ample feeding of prepared dry and frozen products so that food is plentiful during this acclimation period. There have not been any other obvious aggression issues nor fighting among the fish. for filtration and hideouts of all sorts). I made a sincere effort to remove the Tomini yesterday, but have not found a solution for getting him out. A follow-up please... I've read on a forum, with a claimed but not a cited reference back to WetWebMedia, that the Tomini and tribal are 'natural' enemies because they are both algae eaters. Is that valid? Or, can I assume that my experience is an aberration and not the norm? capture the Tomini and replace him with a Kole Tang? The aggression problem has been mitigated by the introduction of my last fish, a Kole Tang that is larger than the Tomini. The Kole actually places himself between the Tribal Blenny and the Tomini. 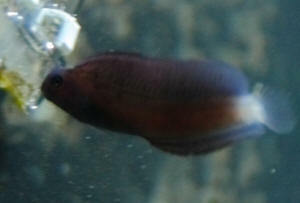 The Kole was purchased still in the bag having arrived at the lfs only an hour before my arrival 4.5 days ago. That's the good news. But the Kole is now showing signs of what might be marine Ich...the blenny has from time-to-time shown 1-3 large white 'stress' spots the size of a table salt crystal. The spots on the Kole can out 2-days after placing him in 65g reef display tank but are much smaller and although more in number covering a wider area of his body they seem lessened each day after initial 'outbreak'. Blenny has been seen scratching himself on rock and substrate. Since seems improbable that I can remove all the fish, do you know if an in display tank treatment like Aquarium Products Quick-Cure Aquarium Treatment will work? And reef safe? What can you recommend for treating fish in a reef tank? <Unfortunately, there aren't any effective reef safe medications despite manufacturers claims....may work, but usually not. There are other alternatives to try and quickly. I would try adding a vitamin mix (Selcon) to the water and the fishes foods, feed foods containing garlic, and adding a couple of types of purposeful cleaners such as Lysmata Shrimp, Gobiosoma gobies, etc. Strongly suggest you read here and related articles/FAQ's found in the header. Good Morning and thank you for your help in the past. Love the site as I am sure you hear often! I have a 150 gallon FOWLR tank with about 100 pounds of rock. The tank is well established. It is not overstocked and can accommodate 1 more fish. I have a 4 inch Purple Tang in the tank now and wondering your thoughts on it being compatible with a Tomini Tang in a tank of the size of mine. There are no other Tangs in the tank with the Purple Tang now and he does not appear to be aggressive to any of the other fish in the tank. Thanks for your input. at the LFS that's been in a few weeks and is feeding really well, I have done my reading up on them and found they are quite placid fish, do you think this would be a suitable contender? Also can you let me know of some other surgeons that would suitable to mix as other options? my fault though I guess should of done the research in advance, was a bit of an impulse buy to be honest (slap on the wrist for me) I've checked the links again and just wanted your opinion if I were to add a yellow or hippo in with him as I've now reverted form the idea of the convict.